Dee Ann says: There’s something about a father’s love for his young. 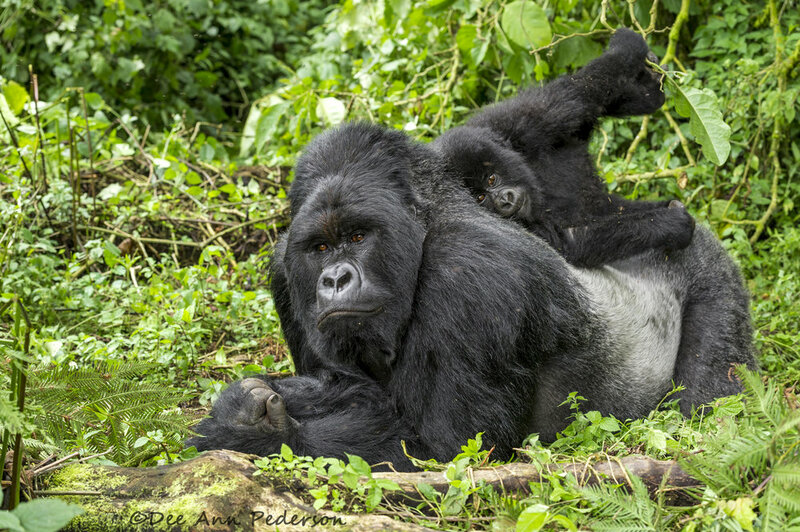 For what seemed like an hour, I sat on the ground in Rwanda’s dense mountain forest, watching a juvenile mountain gorilla at play – somersaulting his way across his father’s back, rolling to ground, getting back up, and doing it again. Wise, powerful and exuding peace and contentment, the silverback “Kwitonda” provided a perfect gymnastic mat, yet, never flinched in the midst of his young one’s play. Of all the large mammals I have photographed across the world, I’ve not experienced a more soulful connection than what I feel with these gentle giants. Straddling Rwanda, Uganda and the Democratic Republic of Congo, these mountains are home to the two remaining wild populations of the mountain gorilla. The largest living primates, these gentle and highly-intelligent apes are near relatives of ours, and live in close-knit family groups. Seriously endangered, threatened by human activity, mountain gorillas are peaceful and intimately social creatures by nature.